A bulldozer pulls down a section of Java House and Shell petrol station in Kileleshwa on August 6, 2018. Demolition week! It sounded like the latest thrill series being produced right in front of our noses. Whether you lived in Lavington, Westlands, Kibera or Nairobi West, demolition was knocking at the door. Two weeks ago, demolitions in Kibera paved the way for 'development', and this week in Nairobi West and Westlands, demolitions did away with 'developments'. A good number of people in large sections of Kibera lost their homes and livelihood after the government embarked on an exercise meant to "ease traffic congestion in the city". In other parts of the city, informal settlers were also evicted by Kenya Power and Kenya Railways to "avoid human injuries, loss of life and damage to property associated with railway lines and high voltage electricity lines". 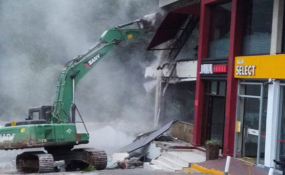 The middle class was not spared, as small business owners woke up to find NYS bulldozers bringing down the Southend Mall and Nakumatt Ukay, each constructed on a river bed. How did we end up here? Such chaos could only have been created by the explosive mixture of two Cs, 'corruption' and 'confusion'. Jill and Yash Ghai wrote in a recent piece, "the Constitution does not value roads more than footpaths, cars more than people, grand railways and glass office towers more than those who are forced to live and do business in mabati shacks and kiosks. The Constitution shows preference for rights over law". Ghai concludes that it is not an adequate answer to say "they were there illegally". There is a remarkable sense of irony in seeing the poor and vulnerable being evicted to create room for a highway, and the better-off being evicted for the love of nature. Why evict and demolish? Who gave the approvals for those buildings to be erected? Whoever did was either negligent or corrupt or both. The Director of Public Prosecutions has ordered a thorough investigation. Corruption and confusion are the weakest links in our investment and development chain. We have spun a messy cobweb of laws and institutions where every strand of spiders' silk is criss-crossed by another ... a cobweb of powers; it is impossible to pinpoint exclusive duties and responsibilities. Every institution has something to say about riparian lands: The county government, the National Land Commission, the Ministry of Land, the Ministry of Environment, the National Environment Management Authority, the Ministry of Water and Sanitation, the Water Resources Authority, the Ministry of Devolution and Planning, the Kenya National Highways Authority, the Kenya Urban Roads Authority, ... all of them with their own laws, by-laws and regulations. Wilson Macharia found out that riparian lands are defined by almost every Act of Parliament involved in the saga: The Land Act (2012), the Environmental Management and Coordination Act (1999), the Water Resources Management Rules (2007) and the Water Act (2017). The 2012 Land Act defines "riparian reserve" as the land adjacent to the ocean, lake, sea, rivers, dams and water courses as provided under the Survey Act (Cap. 299) or any other written law. For the Water Act "riparian habitat" means the dynamic complex of plant, animal and micro-organism communities and their non-living environment adjacent to and associated with a watercourse. Further, Section 116(4) of the Act provides that, "unless otherwise determined by a Water Resources Inspector, the riparian land on each side of a watercourse shall be defined as a minimum of six metres or equal to the full width of the watercourse up to a maximum of thirty metres on either side of the bank." In this case the Act provides that the riparian land shall be measured from the top edge of the bank of the watercourse and this shall also apply to seasonal and perennial watercourses. The Environmental Management and Conservation Act gives key powers to the Director-General. It also says that the minister may, by notice in the Kenya Gazette, issue general and specific orders, regulations or standards for the management of such areas. The Environmental Management and Coordination (water quality) regulations of 2006, the Survey Regulations of 1994 and the regulations of the Physical Planning Act do not walk hand in hand. Unfortunately, Wilson Macharia says, "the enactment of all these pieces of legislation, rules and policies, has been done in a scattered, dismembered and contradicting manner. So much regulation, yet proper management and protection of these areas has not been achieved". How can we establish the width of the riparian reserve accurately? James Mabuti unravelled the mystery. He says that the riparian area is calculated by multiplying the river width by two (though the minimum riparian area is six metres and the maximum is 30 metres). So, if a river's width is four metres, the riparian reserve will be a strip of land with a width of 20 meters in total (8m to one side +4m the width of the river +8m to the other side). If the river width is one metre, then it would be 13 metres (6m to one side +1m river width +6m to the other side). So, if your house is close to a stream or small river with a width of not more than three metres, you should be, at least, six metres away. If you are closer than that, you should get worried. You may have been a victim of confusion and/or corruption. When this happens, Cecil and Kasyoka sigh, some politicians, civil servants and bureaucrats may come for your neck; they will demolish anything that could help them gain political mileage, or help them save their skin while sparing their own buildings. Sadly, the developers of the Southend Mall not only erected the mall right on top of the river, but actually deviated the course of the river. This seems to be the reason behind constant flooding in that area. The current efforts to care for our environment are laudable, but reckless demolitions may cause more damage to the environment, to the economy, to the rule of law, and in the end, be more expensive to the taxpayer. Authorities that did not care about giving consent to constructing on river beds will now have to care about total demolition and clearing of debris. The government wants to make it right, but it may have to be ready to pay billions in damages if appropriate demolition procedures are not followed. When there is a building on riparian land, many of us want to see blood, immediate justice, to destroy it, blow it up! But democracy does not work like that. Democracy is often inefficient and insufficient, and perhaps this is what makes democracy the best system to live in. Dictatorships are more efficient in doing both good and evil. Revolutions are quite sufficient is spilling blood through "instant justice". Dictatorships and revolutions are incompatible with constitutional democracy, which is, for better or for worse, the system we chose to live in when we voted a big 'yes' in August 2010. Our Constitution lays down a long inventory of social, economic, political, administrative, environmental and human rights and duties that citizens, the State and anybody who decided to stay, pass by, or do business in Kenya must respect.